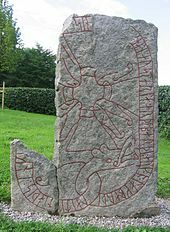 A runestone is typically a raised stone with a runic inscription, but the term can also be applied to inscriptions on boulders and on bedrock. 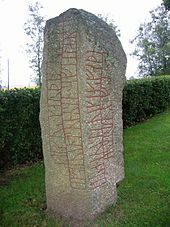 The tradition began in the 4th century and lasted into the 12th century, but most of the runestones date from the late Viking Age. Most runestones are located in Scandinavia, but there are also scattered runestones in locations that were visited by Norsemen during the Viking Age. Runestones are often memorials to dead men. Runestones were usually brightly coloured when erected, though this is no longer evident as the colour has worn off. Most Runestones are found in present day Sweden.